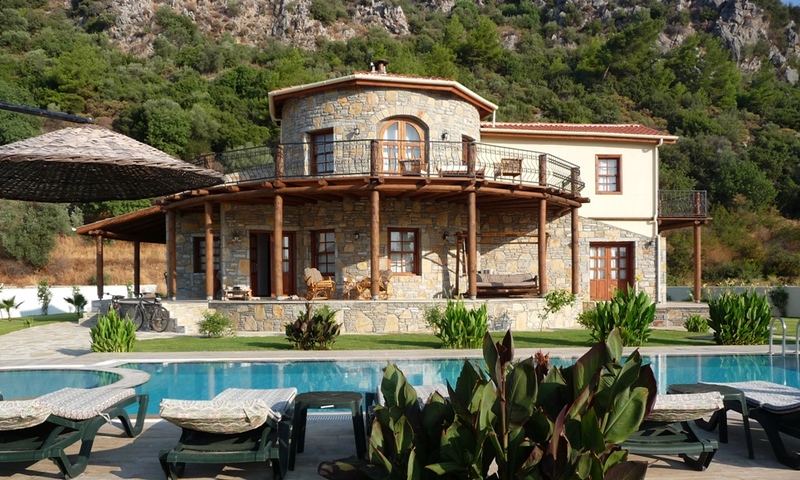 Villa Dalyan is a large imposing house. This villa is split into 3 apartments and can be let as individual apartments or works equally well for a large group of up to 16. The garden, pool and barbecue area are extensive enough for any number of people and the surrounding area has stunning views of mountains and cotton fields. The villa is less than 7 minutes walk into the centre of Dalyan and there is a small supermarket within 4 minutes walk. Villa Leisha is an exclusive cappadocian stone villa built in 2008. This luxurious villa has 5 bedrooms all en suite, a large terrace, private swimming pool, outdoor heated jacuzzi and an indoor jacuzzi bath. The villa is set back in the peaceful and private location of Arikbai with an uninterrupted view of the mountains and fruit orchard surroundings. The villa accommodates up to 10 people with its 5 bedrooms and spacious living area.